Artists have a wonderful tool at their disposal called “Artistic License”. Basically, it means “anything Goes”. They can break away from conventionally accepted rules, adding or subtracting elements, moving objects to suit the frame, etc. The list is endless, the reality of the final work is simply down to a matter of personal taste on behalf of the artist. The public accept, if not expect, this as a genuine part of art and barely raise an eyebrow. Unfortunately, photography is not viewed as an artform by some. As a landscape photographer, breaking those traditional rules can be a very different affair depending on your personal view. In the past, photographers were constrained by what lay in the view finder. The decision to include and exclude certain elements within a frame were made on location. Today, photoshop has completely turned this concept on its head. Like artists, photographers now have the ability to create anything the mind may conceive. At what point does photography cross that invisible line, becoming digital art? I have my own personally views on this question. The degree of manipulation depends on the genre of photography we operate within. Just because we can do something does not necessarily mean we should!!! Some clubs & competitions have rules regarding post production, whilst in others, anything goes. Once the boundaries are established, all is fair in love and war. Some will push these boundaries to the limits, whilst others will strictly choose a more traditional approach. Firstly, let me state clearly this is not a rant, rave or pop at any other photographer. I firmly believe in the concept of “Each to their own”. The line I talk about is invisible and unique to each individual. For some, it is moveable with time. What is acceptable for one, is unacceptable to the other. At the end of the day, who is right or wrong? In my opinion, neither as this is a very personal choice. It’s a very grey area at best. When I set out to create a composite for a competition, the only limit I have is my own imagination and post production skill. I have a very different opinion when it comes to breaking the rules in landscape photography – by that I mean my own personal work, & not that of others. For my own landscape photography, I personally believe the craft of photography is fundamental in staying true to what I perceive in the field. I still would not describe myself as a purist. Personally, I fall somewhere in the middle. I have no problem removing a distraction, but shiver at the thoughts of adding something that was not there in the first place. I will tweak white balance and colour without a thought, but can’t understand how someone could replace a sky. How can they argue that such a landscape image was authentic? Yes, the image may look stronger, but it’s not really what was there at that time. However, I have just admitted I have no problem tweaking colours so how original are my images with respect to that which lay before me? I have no problem combining several frames from the same location at the same point in time, focus stacking, HDR etc. I’m undecided about how I feel regards the recent trend in focal blending yet I definitely draw the line at blatant stretching of mountains. Who’s outlook is right? Do both methods not achieve the same end? Personally, I’m still a little confused. There are more questions raised than answered when considering boundaries within my own landscape work. I may be one of those guys whose line is still moveable. I know several people who are probably about to start spitting at their computer as they read this proclaiming me a cheat and a hoax. Whilst others will think I’ve not gone far enough. New Years morning was bright and cold with a stiff breeze. I found myself at Whiterock, just south of Dublin. The waves were rolling in nicely as the sun rose from below the horizon. As each wave receded slowly back down the beach, another would crash across the rock. The scene was pure drama at its best. Unfortunately, it was proving difficult to nail within one frame. A short shutter speed froze the action of waves crashing into the rock, but left an unattractive foreground. 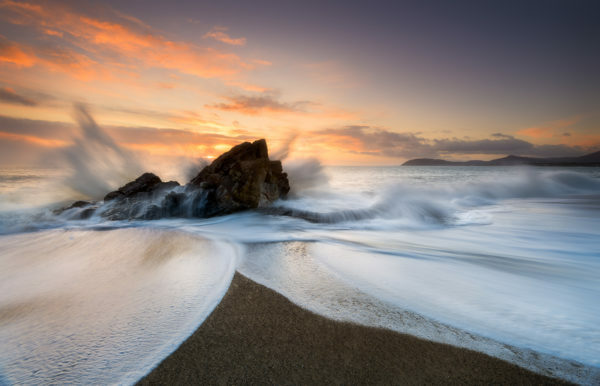 A slow shutter speed created a beautiful foreground line, but blurred the crashing waves in the background to a fine mist. In the end, I had no choice but to combine 3 shots. Each image had a shutter speed suited to the area I intended stitching into the final image. For me, the result is very pleasing. However, how true to reality is it. The mind works in mysterious ways – what I could not capture in one image, is still very representative of what I experienced that morning. The move away from the traditional one shot approach was a necessity. As I have said before, each to their own. I have no interest in nit picking how others create their work. Vice versa, I have no appetite to listen to what others feel are the rights and wrongs of my own unless I specifically ask for an opinion. Very self centered but brutally honest…. This is where I have my biggest issue. If you’ve done something between capture & print to create your vision – never be ashamed! Don’t feel the need to lie and say it’s a straight shot with little or no processing. All raw images need work to some degree or other. Nobody has the right to impose their own constraints on anybody else declaring their point of view more important than anybody else’s. Many of us spend out lives living by rules imposed by tradition and accepted practices. Our art is a place to escape that and set our own rules. Artists are generally not ashamed of the techniques they have learnt or created. If anything, they push these as selling points. I firmly believe that photographers are artists – we just paint with light instead of a paint brush! The rules are there to be broken and there are no rights or wrongs anymore….. don’t be afraid of breaking the rules in landscape photography. We simply set our own rules.